"Lowe's energetic first novel is led by ten-year-old Poppy, who was born in the Patisserie Marie Claire Bakery in the town of Potts Bottom. While Poppy has inherited the gift of magic from her highly respected Great-Granny Mabel, she wants nothing to do with it. Baking makes Poppy happy, and after three years at Ruthersfield, a magic school her parents force her to attend, she is fed up....Lowe makes the story's arc (and message) clear early on: the Ruthersfield motto translates to "Follow your passion." Reader's will easily empathize with Poppy and recognize the loneliness and anger that accompany being misunderstood." As we all know from best-selling series, you can’t buy magical powers—you either have them or you don’t. Poppy Pendle’s parents are overjoyed when, as a baby, she creates sweets out of thin air; they want to enroll her right away in the witch academy. It soon develops, though, that Poppy’s passion is for baking, not spells, perhaps due to the fact that she was born in the town patisserie. Lowe’s diverting first novel follows the sympathetic Poppy as she tries to convince her parents not to force her to become a witch and secretly befriends a nonwitch neighbor and the patisserie’s owner. But when her parents remove the oven from their house—well, then they’ve gone too far. Lowe presents Poppy’s turn to the dark side as both understandable and disturbing. But of course friendship and good food win out in the end. Ten recipes of the story’s scrumptious-sounding desserts are included." There is a strong essence of Roald Dahl to this story, in which controlling characters like Poppy's mother are laughable in their awful obtuseness. This is a crowd pleaser with the added bonus of Poppy's recipes at the end." 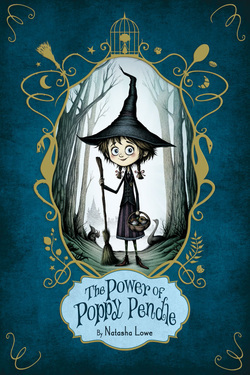 At first glance, The Power of Poppy Pendle seems like just another clone of Harry Potter, but it is so much more than that. The plot is deceptively simple and soars with the message to be yourself, no matter what. Poppy and the surrounding characters are tremendously lovable. You'll adore Poppy and stick with her through thick and thin. There are many plot twists throughout the book, and I couldn't stop reading! And I read The Power of Poppy Pendle with a huge grin on my face because there was so much humor sprinkled throughout the book. This is a vivacious, heartwarming, charming, and simply amazing debut. Natasha Lowe has cooked up a totally spellbinding read that you won't want to miss! This was the cutest little book! Poppy Pendle is a young girl who was born in a bakery. From that moment on, she's loved to bake, and has an extraordinary talent. But she's a witch. A really good witch. Her parents (particularly her mom) are so excited she's a witch, they enroll her in the local school for witches-Ruthersfield Academy. It's a big deal to be enrolled at the academy, and Poppy has such a natural talent for spells and flying on a broomstick she's soon at the top of her class. But she hates being a witch. She just wants to bake. Her parents aren't understanding at all, and Poppy runs away to stay at the patisserie in town with Marie Claire, the owner and baker. But there's trouble, and Poppy's unhappiness explodes into a disastrous event. Can she find happiness and also make her parents happy? I loved this book! Poppy is adorable, and her passion for baking shines through the story. This book is a great reminder to young readers to follow your passion. It also includes recipes at the end of the book for all the goodies Poppy whips up throughout the book. More than anything in the world, Poppy Pendle loves to bake. Her parents, however, want her to pursue her magical talent and become a great witch like her Great Grandmother. Poppy must decide whether to go along with what is expected of her or follow her passion. Cleverly written, this book is a delightful read that would appeal to upper elementary students who enjoy tales of magic mixed with realistic fiction. It would also make a great read aloud selection for elementary students. Poppy navigates common issues of fitting in, communicating with parents, dealing with mistakes, and finding true friendship. There are conflicts between Poppy and her parents, with both parties learning the value of listening and compromise. The section at the end of the book full of Poppy’s baking tips and recipes was a particularly delightful touch.